Salisbury in Advent: "From Darkness to Light"
My earliest formative musical influences - aside from a lot of undoubtedly tuneful humming by my mother - were as a chorister at Salisbury Cathedral. Singing for at least two hours a day, six days a week during - and sometimes outside of - term times is an exacting discipline for any youth. Some say there is no better start for a musician, but I had no such ambition. The finer points of Renaissance polyphony may have been lost on me, however I did enjoy the music of Purcell, Walmisley, Wesley (S. and S.S.), Stanford, Britten and others. 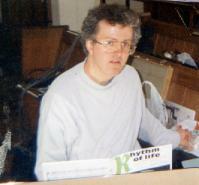 Richard Seal - as Director of Music - was always inspiring both as a musician and as an individual. Aside from my cathedral existence I was a fairly normal, if reserved, boy who enjoyed playing football or cricket rather more than practising the piano, and listened to chart bands such as Slade, T. Rex, Bowie and The Beatles. 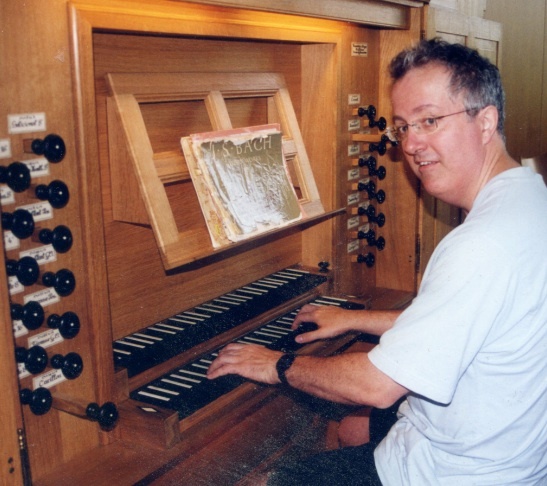 After further inspiration from Patrick Russill at the organs of the London Oratory, I did a degree at Royal Holloway College (London Uni): this included composition studies with Brian Dennis and organ with Martyn Parry. They too were Messiaen enthusiasts. Brian was also seriously into Janáček, as well as other, more recent composers such as the American minimalists. He was, therefore, at least partially responsible for the somewhat repetitious nature of some of my music, and for my predilection for unorthodox, frequently changing time-signatures and rhythms. (All of these features my be noted in my first student composition Four Flutes.) I'm grateful to him for this and more besides, not least his tremendous encouragement. Since then I have been largely preoccupied with teaching, composing (sometimes composing for teaching, as in Maritime Melodies) and being an organist - first at the the Church of the Sacred Heart in Wimbledon; then for twenty years (also as choirmaster) at St. John the Baptist in Batheaston, Bath. 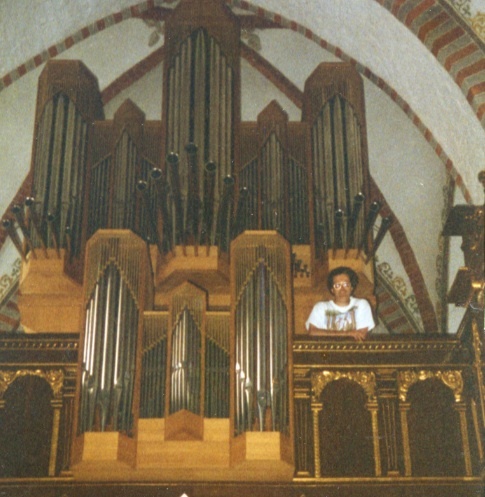 There I also performed in and organised many concerts, including a series of morning recitals described by Venue magazine as a "Coffee Drinkers' Guide to the Organ Repertoire". I managed to win a prize for my A.R.C.O. organist's diploma, in spite of stiff opposition from organists very nearly old enough to shave; and I have accompanied choirs on organs in cathedrals in England and Ireland, and given recitals in Denmark and Germany, including in 2009 one to celebrate the twentieth anniversay of the installation of the organ in the Markuskirche in Mulheim-an-der-Ruhr. 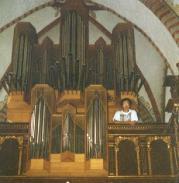 For liturgical use at St. John’s I composed, amongst other things, three Mass settings. Also at around this time I wrote my first collection of organ pieces, the Bailbrook Suite: while some of this shows minimalist traits, the Finale is in a more challenging style for both player and listener. 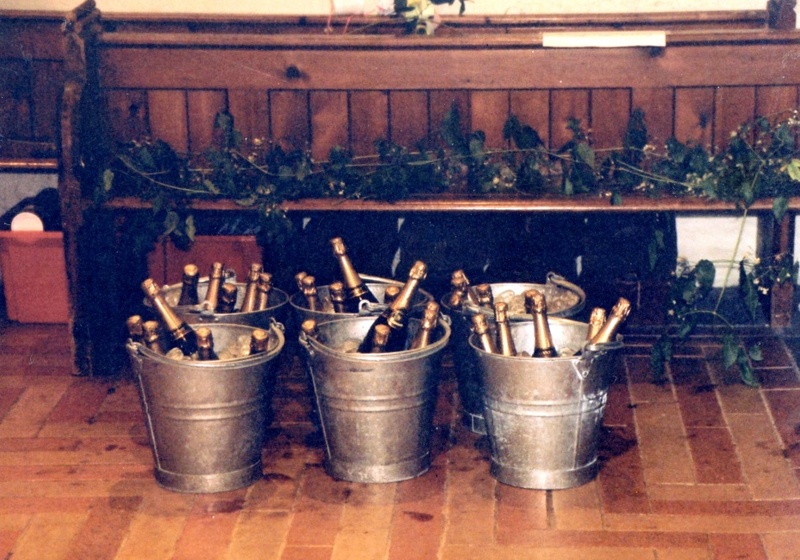 It was during the mid-nineties that I “ran” what was (ostensibly) a singing group – probably more of a “Wine Drinkers' Guide to the Singing Repertoire” - called The Nightingales. We had a lot of fun, and we occasionally sang. 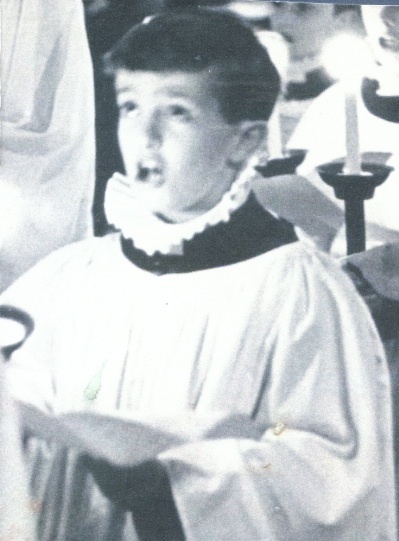 We even managed a mixed voice version of Britten’s Ceremony of Carols at a Christmas concert once. They inspired me to write such ditties as the Wordless Songs and some folk arrangements. I have from time to time been an accompanist for a fairly wide variety of singers and instrumentalists, and not just in church. 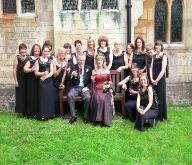 My longest regular stint as such was for ten years with The Jane Lilley Singers, a Bath based ladies’ choir who sing a wide variety of music to a very high standard. They sang some of my compositions including slightly more complex folk, and carol, arrangements. I was pleased recently to be invited back to play for part of their fortieth anniversary concert, and to hear them sing once more my version of Scarborough Fair: the previous such occasion being on my wedding day in 2005 at St. John’s, a performance perfectly punctuated by the popping of champagne corks by the ushers – clearly (and rightly) determined to carry out their duties, whoever happened to be singing at the time. If the Nightingales and Jane’s Lilies were partially responsible for a slight mellowing of my choral compositional style, my relatively recent interest in writing for - and, indeed, playing - the piano owes itself at least partly to further studies with pianists Philip Martin and Brenda McDermott (leading to a piano performer's diploma), as well as to the encouragement of my wife Gabriele - who has given me the confidence to fulfil my potential - and the forebearance of our various collie dogs. Midday Moonlight is, for me, more than just a collection of pieces: it is a carefully constructed and contrasted musical sequence or cycle, steering from serious sounds to the edge of jazz and back: for example, a tongue-in-cheek “spoof” – as one friend helpfully described Claire on the Moon – juxtaposed with the more reflective shimmering of the title track, and followed two tracks later by a tribute to Thelonius Monk. There are also mood swings to match my own - for example the introspection (and neo-Baroque architecture) of The Distracted Chaconne is sandwiched between the sunny-natured Carethree and the extrovert abandon of Latino Eduardo. This album represents a new turn in my musical life – the organist liberated from his regular duties is discovering new and unexpected vistas as a pianist. While the above represents my “official” story, I am not ashamed to admit there have been at least two extended and bleak periods of my life. I have suffered from chronic bouts of insomnia, anxiety and depression: in the worst instance this resulted in a hospital stay spanning several weeks. Throughout all the good and the less good times - and with all due respect to those friends who have supported me greatly - music has, until relatively recently, been my most constant companion. 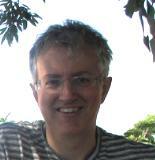 Composing, in particular, has been very therapeutic. If I am the sum of my experiences, then the writing of my music is both a part and a product of those experiences.